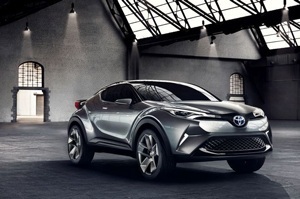 Young, urban, creative customers told Toyota, “Polarizing is okay – Boring is not.” And our designers took that to heart in a big way when creating the Toyota C-HR Concept – a high-style vehicle that combines a compact size with a high ride height. 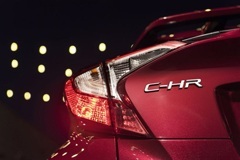 And now, Canadian drivers will get their first look at the C-HR, as Toyota brings it to Québec City in March. The Toyota C-HR concept embraces the idea that young, creative types and trendsetters like to do things differently. This makes it the perfect vehicle for the young, urban, creative people who inspired the design. The Toyota C-HR emphasizes great design in a distinctive form – breaking away from the conventional language of compact SUV design. With full creative license, Toyota’s international design team crafted a vehicle that reinforces the C-HR’s purpose as an urban lifestyle vehicle. Taking inspiration from a diamond with sheered sides, the C-HR cabin is like a precision-cut gemstone. Graphite black accents on the grille, rear bumper, fender flares, and lower side panels reflect the strength and stance of the vehicle. Meanwhile, the all piano-black roof enhances the C-HR’s sleek and stylish profile. The 21-inch wheels continue the cut gem theme and feature spokes with chiseled cut-outs shaped with the car’s profile in mind. Underneath the captivating design of the C-HR is a platform featuring Toyota’s New Global Architecture (TNGA). TNGA is an innovative and integrated approach to developing new platforms and powertrains for Toyota – resulting in a lower centre of gravity, increased body rigidity, more responsive handling, and improved ride comfort. The C-HR has a high ride height, yet is also a fantastic urban driving car – with refined driving comfort and steering that is responsive and precise.